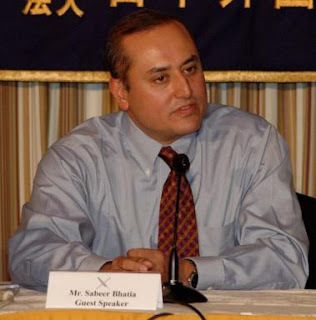 Sabeer Bhatia has been trying hard to beat his one trick pony reputation. After trying his luck with Arzoo and Live Documents, the man who sold Hotmail to Microsoft has now launched an online tool for facilitating teleconferencing at no extra cost to the user. Looking at the website, one thing that struck me as odd was the image used on the home page. It shows five young people sitting on a couch, all sticking a cell phone in their ears. Are they having a conference with each other through the advertised feature? ‘Cuz thats what it looks like! (Kind of funny because they are sitting right next to each other). For starters the service is available only in India. Limit is set to ten members per conference. The whole process works like any other conferencing. The only difference being here you have to first register on SabseBolo (Loosely translated it means Talk To Everyone) , on the successful completion of which you are presented with a pin number. That pin number is your key to connect to others after all call in on the universal SabseBolo’s telephone number. The website does not reveal much about SabseBol’s revenue model, although news reports indicate that initial five seconds of the conference call will be allocated to advertisers for as low as one Rupee. The site is still in Alpha, so I would be surprised if they have already gone live. Alpha build is usually the release made to the Testers. If there is a free service with jingles, it sure makes sense to provide a paid one with no jingles, commercial free service. Also, the paid service should allow for more than ten callers to connect and participate in the conference. How about international callers. They should thinking of making the service open to local and international callers. Again, they could keep it free for ads driven and commercial free for the paid service. On the whole the idea sounds pretty neat but if users were to take to it we are sure to see some tough competition emerge. After all conferencing is basically an extension of the regular call you make, only this time more than two folks are hooked on. Since India has heavy hitters like Airtel, Reliance, Vodafone etc., I don’t see why they wouldn’t want to move in and throw their hats in the ring. For SabseBolo to remain in business and flourish, and not swim at the bottom of the web 2.0 dead pool, it is imperative that it builds its business model around a unique set of features and services, differentiating it from the convention telephone service providers. In short have its own secret sauce. Good luck to the SabseBolo team.